Tarragon plant is native to southern regions of Russia and Mongolia, and today it is the most cultivated and used in France similar to dill. In the Middle Ages it was used as an antidote in case of snake bites, and in the Arab countries for the treatment of anaemia. Its Latin name is Artemisia dracunculus, and it is also known by the names: snake grass, dragon plant. The tarragon spice is rich in phytonutrients, essential for good health, and above all, it is an excellent source of antioxidants. In addition, this spice contains a high percentage of essential oils and bitter substances that stimulate the appetite, the secretion of bile and digestive juices. Read on to learn how to use it for medicinal purposes. This perennial plant has a rich branched stems of bright-green colour, like the bush and can reach the height of 60-120 cm. 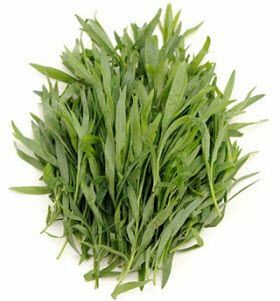 Tarragon has a root of serpentine form, leaves are greenish, and very narrow. It releases oil on its bottom side, flowers are yellowish with round heads. The whole plant has a bitter taste and specific penetrating odour. It contains a considerable amount of vitamins A, C and B-complex (folate, pyridoxine, niacin and riboflavin). It is an excellent source of iron, magnesium and calcium. The main constituents of the essential oil are estragole (methyl-chavicol), cineole, fathers, tannins, terpenes, flavonoids, coumarin and eugenol. In France, this spice plant has a particular price and is used in many recipes and specialties. It can be grown in gardens like some other plants. Warm and good sunny places suit it, while damp and cold damage it, this is true for almost all of the French varieties. Unlike their Russian counterparts it can handle the temperatures of 10 degrees C.
In cooking mostly used are young shoots and leaves - both dried and fresh. The precious essential oil is very appreciated in phytotherapy, and its largest concentration is immediately before flowering, when this plant is harvested. Note: Essential tarragon oil is not be used by children and pregnant women without consulting a doctor. Tarragon spice plant prevents digestive problems and contains a high percentage of essential oils and bitter substances that stimulate the appetite, relieves inflammation of the lining of the stomach and suppress stomach cramps. This spice stimulates the secretion of gastric juices, improves digestion, and is also known to stimulate the liver and bile secretion. It relieves the symptoms of anorexia and flatulence, and also in folk medicine tarragon was used as a remedy for constipation and intestinal parasites. Its antioxidant properties neutralize free radicals. Many studies have shown that tarragon oil prevents the formation of free radicals and reduce the damage done to organism. This spicy herb effectively lowers bad LDL cholesterol and prevents atherosclerosis and cardiovascular diseases. Laboratory studies have shown that an extract prevents the formation of blood clots, and thereby prevents thrombosis, which can be fatal. Tarragon plant contributes to the formation of haemoglobin and prevents deficiency of red blood cells, or anaemia. It also helps in the synthesis of proteins, which regulates the formation of cells. Given that it is very rich in calcium, this spice strengthens bones and maintains bone system. In addition, promotes the absorption of creatine and increases muscle mass. Tarragon herb is very helpful for the health of female reproductive organs. It is scientifically proven to regulate the menstrual cycle and relieves the symptoms of PMS. In addition, removes stomach pains, nausea and relieves stress, and helps in case of rheumatoid arthritis. His essential oils improve circulation and contribute to the proper distribution of nutrients, oxygen, hormones and enzymes throughout the body. It also stimulates the secretion of urine and prevents retention of uric acid in the body. It has a beneficial effect on the health of hair, accelerates its growth and prevents hair loss. In addition, this plant has a beneficial effect on the skin - antibacterial properties accelerate the healing of wounds and cuts. Among other things, tarragon plant has antiseptic and anaesthetic properties, and is used in the treatment of dental pain. Also, provenly relieves pain in the gums, which often occurs together with toothache. We have prepared three great recipes in which the tarragon plant is simply irreplaceable. If you love to watch cooking channels on cable TV, you have probably noticed that this spice is often represented in a number of specialties. Often it is used by the popular Jamie Oliver. In a small bowl combine butter, tarragon seasoning and garlic granules. Combine chicken well with salt and pepper, and with a knife make a dozen cuts on the skin. Then put the prepared mixture on the cuts and use the rest to coat the chicken and sprinkle it with lemon juice. Then you need to put it in a baking dish so that their backs are facing up and bake in oven at 200 ° C for about an hour (until golden brown). Remove it from the oven, add the potato, tomato and garlic, salt and turn the chicken breast up. Pour a little olive oil and bake for one hour at 200 ° C.
This tasty dish is prepared for about 2 hours and is one of the moderate difficulty. In a saucepan put finely chopped onions, wine vinegar, white wine, salt, peppercorns and tarragon seasoning. When it boils, let it simmer with two tablespoons of liquid. Strain and pour the liquid into a small saucepan. Whisk the eggs and steam them, then add one by one cube of butter with constant mixing. In the end, add salt, pepper and put a tablespoon of finely chopped tarragon. Chicken fillet cut lengthwise, season with salt, pepper and sprinkle with olive oil, and bake it on the grill. Serve with prepared sauce. Béarnaise sauce is more demanding foods and for its preparation will take you about 45 minutes. Mush the butter and combine it with tarragon and parsley. The mixture is divided into 4 parts, and use it to roll it and make the size of the average kebabs, and put them in the freezer for an hour. Fillets are cut and open like a book, cover them with plastic foil and roll out the kitchen hammer. Use the knife to shape them so that they are approximately rectangular in shape, add salt and pepper. Remove the kebabs from the freezer, place them on each file and twist them into rolls. The rolls roll in flour, then in the scrambled eggs and finally in breadcrumbs. Deep-fry them in a pan or deep fryer. Pickles, half an onion and a few cloves of garlic finely chop, and mix with mayonnaise, mustard and 2 tablespoons of lemon juice. Add salt, pepper and mix well, and serve with rolls. Kyiv chicken is one of the more demanding dishes to prepare and you will need about 2 hours for it. We hope you learned how to use tarragon plant in a number of specialties, and that it will find its way on your tables.